I Run Ultras.com: Merry Christmas !!! Rest days always seem to come at the right time - and I'm taking two of them. Today my office is closed, but the wife's is open for business, so, it is just me and the two little ones at home getting ready for Christmas. Watching them (ages 5 and 6) write their letters to Santa and bake cookies brings back a few memories. Tomorrow we will all head over to my parents house for an awesome Italian Christmas feast. Finally getting to meet one of my heroes - coach Lisa Smith-Batchen. What an amazing woman and amazing coach. See ya soon ! Finishing the fourth and final climb up "Fred's Mountain" at GTR 100. Bryon Powell - What Bryon did for me at GTR 100, pacing my final 20 miles (after he had paced AJW 30 miles through the night), I will never forget. 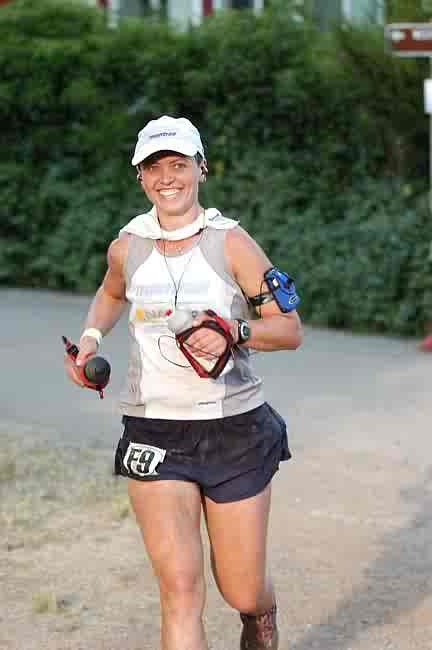 Olga - repeatedly punching me in the arm at some point around 70 miles at GTR 100, while asking me how my arms felt. I think I recall my reply to be "great, until you started hitting them". This amazing woman is another example of people in the sport of ultra running who enjoy helping others more then competing. Ira Zaroff's unbelievable performance at GTR 100. Less then 50 miles into the race, the "I-Man" develops blisters that bring excruciating pain to each and every step he takes. At mile 50, after getting treatment and shots to numb the pain, he's back at it for another 20 miles, to the point where he simply cannot take another step. We all think he's done...and he drops. Or does he....6 hours later he re-enters the course, blisters, pain and all, and finishes the 100 miles. The desire to finish, the guts to get back up after being knocked down - this is one of my most favorite memories of the year. Meeting up with everyone for dinner at Ledo's the night before JFK 50, and then acting as Bob Gentile's pack-rat/pacer/crew member for the entire 50-mile event. I also was able to spend a lot of time with Meredith, another amazing and accomplished runner. Meeting Tom Triumph and Kira Matukaitis, two Badwater veterans, and hearing all about the adventure. The Knight's Inn vs Galvin's basement. GTR 100 - one of the best (from an organizational standpoint) and most challenging that I have participated in. Aside from the memories of 2007, I am so lucky to have met so many wonderful, fantastic (and interesting) friends this year. To Bob, Meredith, Bryon, Olga, Juan, Tom, Kira, Terry, Ed, AJW, and anyone else I missed, it was great to meet you all this year, and it has been fun continuing to keep in touch ! And, of course, there is my good friend Ira Z., who's performance at GTR 100 was inspirational, and whose friendship I value the most. Ira's guidance and encouragement continue to be a major part of running for me, and I can't thank him enough for the last several years of friendship. MERRY CHRISTMAS!!!!!!!!!!!!!! It has been a great year for both of us. I was so happy to finally meet you at the Teton races. JFK was a blast, and i cannot wait for Rocky Raccoon! Looking forward to many more good times with you in the future. Enjoy Christmas with the family. Loved the PAC link!!! Did you make it up? I am blessed in joining ultra-ganh and meeting people like you! I am psyched for each and every one of you, happy I get so many wonderful people, slefless and powerful, and happy from inside out:) Happy Holidays, Tony! And I hope your arm healed up by now:) I was just trying to take your pain and attention from other parts of your body - that's my lame excuse and I am sticking with it! I was just trying to take your pain and attention from other parts of your body - that's my lame excuse and I am sticking with it! I love it. Totally worked. Yeah...I made the PAC logo on a whim just to see what I could come up with.